East Hanover, NJ – May 4, 2018. 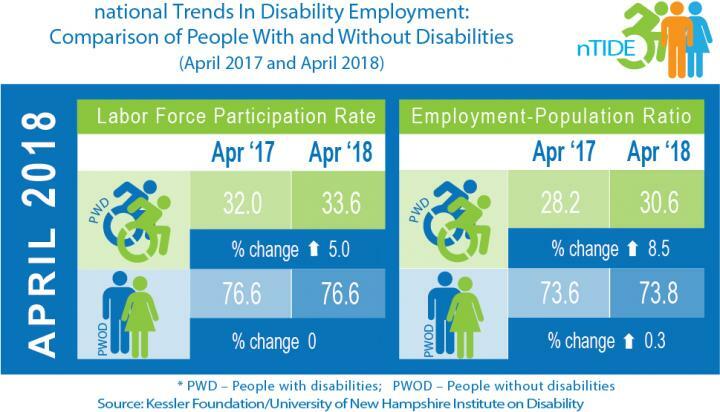 Americans with disabilities added another month of job gains, according to today's National Trends in Disability Employment – Monthly Update (nTIDE), issued by Kessler Foundation and the University of New Hampshire's Institute on Disability (UNH-IOD). As today's tight labor market offers greater opportunities for jobseekers with disabilities, there is renewed interest in strategies that help people with disabilities achieve their employment goals.